The Internet has emerged as a dynamic service-centered environment. How to combine several individual services to provide value-added services is an ongoing research challenge, mainly because dynamic service composition cannot be accomplished easily and the users’ intentions regarding service interconnection have to be anticipated by the service developer. To overcome the drawbacks of developer-centric service composition, we propose an approach to user-initiated dynamic service interconnection characterized by a high degree of usability. We outline a solution for semantic interconnection of two or more services, which provides information that would not be available by using a single service. 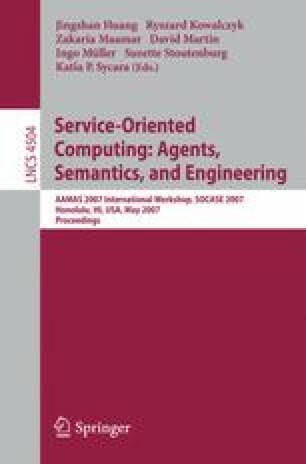 Based on various interconnection types, we have developed an architecture for user-initiated semantic service interconnection utilizing the planning and negotiation capabilities of intelligent agents. As proof of concept, we have implemented a Web 2.0-based service suite consisting of various individual entertainment services, which assist users in planning their leisure time.